a couple of *#^&$**(# lazy, self-centered morons had left their carts in one of the few handicap spaces. The red starts show the handicap spots. 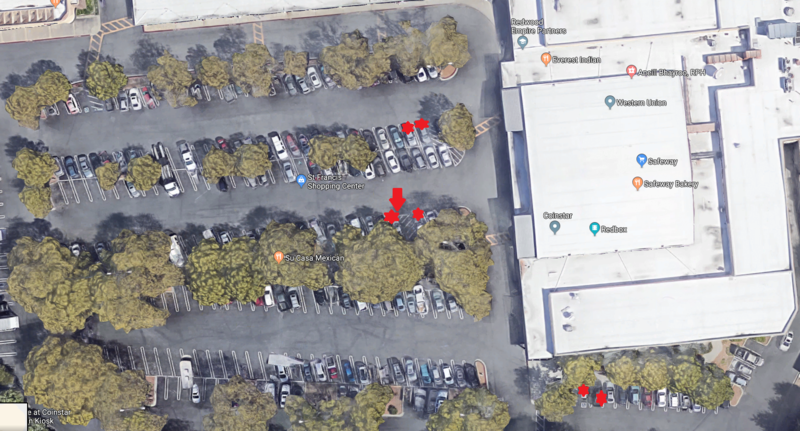 The red arrow points to the spot where the carts were left. Three spots to the left of where they were left is a cart corral. Next to the two handicap spots towards the north (top) is another. Also by the trees across the lane. Sad how ignorant some people are. If anyone chastises them for their ignorance/stupidity/laziness, they get hurt feelings or want to start a fight. Around here they usually get belligerent and very foul mouthed. Then get in their Prius with all the political stickers, give the one finger salute, and zoom off. By the way, I didn't just take the photograph and leave the carts there. Since I needed a cart anyway, I took the short one for myself, and dragged the other one to the cart rack by the door. I always bring at least one back from the lot. I had a lady mention to me: " You're handicapped and using a cane. Why should you be doing that?" I replied: "Because I'm physically handicapped, not ignorant!" Besides, the grocery cart lets me use it like a walker. If you saw Hubby, you'd think he didn't have any problems. Unfortunately, I hear the thuds when he falls in the house. Some people, far too many, only care about their own needs and wants, and the hell with the rest. I see stuff like the following all of the time at Costco. Several of us will be waiting to sample the stuff they put out or get chicken when the rack had been empty. Then along comes someone who crowds in. That's when that mean ol' bully in me just jumps out and points to the end of the line. Sometimes I don't even have to say anything!! Sometimes I have to get really rude!! Even I don't like me when I'm rude!! This time I politely said, the end of the line is back there and pointed. He said sorry and picked up the chicken. That is when I bit my tongue. I won't repeat all of what I wanted to say. It begins with, "No you're not, you're -------!" I wouldn't have liked me, if I'd said what I thought. Joe, just yesterday I moved a cart from a handicapped spot and one from a veteran’s parking spot at Lowe’s. I went ahead and used the cart from the veterans spot. I had parked in the second Vet spot. When I came out there was an Asian guy pushing an empty cart towards the still open Vet parking spot. He was just leaving his Mercedes that was parked across from the Vet spot. I guess he put some things in his trunk. He glared at me for a second and then turned right and put the cart in the cart corral a couple of spots away. As I backed my truck out he flipped me off. I rolled down my window to call him some colorful names but he had scurried to his car and got in. Sometimes I really dislike people. When we lived in Sacramento, I'd leave to walk to work at about 6:15. There was always a ------- guy honking his horn for the guy he gave a ride to. One day, I'd just had enough. So, I beat on his window, he cowered. I yelled people are still asleep, go knock on the door! He never honked his horn again. I see this all the time at parking lots around here. Our local market has a blue spot, a cart corral and then a regular spot. I often see carts blocking the handicapped spot which means they went PAST the corral to leave the cart. It's all part of a campaign from sometime ago for folks to just Do It, and if it felt right it was okay. So so many are only concerned about themselves and have no concern at all for how their actions affect others. I once faked a stalled engine for several minutes behind a poser using a handicapped spot. I even learned a couple new cuss words!! I recently watched a fellow deal with the mis-use of a Handicapped space. Mr. I'M Too Important and Too Busy to be Courteous, parked his vehicle in the handicapped space. He had no Handicapped sticker etc and had his hockey bag in the back of the car. When he returned to his car, he found shopping carts next to the driver and passenger side doors of his car. When he tried to move them, he found the c arts had been Zip-tied to the door handles. I hope his day got better after that. I was faking a stalled engine for several minutes behind a poser using a handicapped spot. I even learned a couple new cuss words!! I am sooooo going to try this one! I think I'll start carrying zip ties in my truck too! I REALLY wish I could give this post about 100 likes. So much creativity! Love it! Saw a bumper sticker once--- " I'll gladly trade my parking space for your legs"
Now that I'm old, I don't seem to keep all my comments to myself . The rudeness of people today sometimes over runs my better sense to shut up. They haven't completely ruined my 1st amendment right yet. There is an annual ethnic festival in a park near the condo complex a former girlfriend lived in. Upwards of 25,000 people would attend and the park only had a few hundred parking spaces so the attendees would park everywhere within a couple of miles. Well, we came back to her condo and there was a car in her designated spot. So, I got my tow strap, tied it to the car in her spot and with my full sized Bronco, I pulled the car out of the spot, dragged it about 200 feet and left it next to a fire hydrant. Injun, I could have used that once. I got up to go to work, I was working at an office in the 'burbs, and there was a car parked across our driveway blocking my car in. I just drove down the sidewalk to the alley. Now that I'm old, I don't seem to keep all my comments to myself . The rudeness of people today sometimes over runs my better sense to shut up. I never had a sense of Shut Up. And as I've gotten older, It's even worse. I yell at people in traffic, too. With the top off the Jeep. I think I can one up all of you for shopping cart thoughtlessness. One time the lady next to me and I were unloading our groceries at the same time. I got done before her and took my cart to the cart corral. She got done and shoved her cart behind my car. I saw what happened so I dind't hit it. I was even planning to put her cart up for her because she had kids in the car and was the only adult. Mind you, one of the kids was plenty old enough to put the cart up, but that's not my business. If I had it to do over again, I would have just hit the cart and tried to bounce it back at her car. I often offer to put up people's carts. When it's a young person, I do it to shame them. When its an older person I do it as a kindness. About all I can say is I'm glad they never had shopping carts back in the Old West. 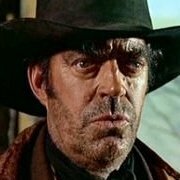 The streets of Tombstone and Dodge City would've been running red rivers! Oooh...I saw a fight occur over this same thing a few years ago. I woman emptied her cart and placed it behind the car next to her. The lady getting into that car got mad and yelled at the rude woman. The rude woman gave her the finger and said some things I can't repeat here. The other lady came around her car. Rude woman went towards the lady and she was running her mouth. The lady punched the rude woman so hard it made my teeth hurt. Apparently that lady knew something about fighting. Rude woman collapsed. The lady took the cart and rammed it into the back of rude woman's car then got into her own car and drove away. Awesome! I also left. No other witnesses and I didn't see nuthin'! By the way, this isn't "one upping"...Your story reminded me of this. I would've loved to see that one Pat!